It’s highly RELATIONAL. It shifts from Sunday school teachers who try to deliver the entire lesson in classroom teaching style to small group leaders who help kids discover the truth of God’s word. It uses CREATIVE presentation techniques. When all the kids from the ages grouped together come to watch the Bible event, it might be a story tell presentation, interactive drama, or even video clip. Puppets help set up the lesson. It is JESUS-CENTERED. All lessons point to the main theme of the Bible: God’s rescue for us through His Son Jesus. The broad biblical scope gives you a balanced 10 year scope and sequence. What else? It speaks the language of kids: FUN! Why shouldn’t learning be highly participatory and fun…especially at church? It utilizes hands-on experiential learning aimed at multiple senses and learning styles. It even gets at the emotions behind Bible events. Ages 2-3 & Ages 4-5-K Large group. Small group. Large group. Children begin together with a group presentation of the Bible event. Then they move to small group activities of snack, game and craft. They wrap up in a group together a puppet and a lesson review. Grades 1-4 Small group. Large group. Small group. Children begin in small groups, move to large group presentation, then return to small group for Bible discovery and a learning activity. Grades 5 & 6 Small group. Large Group. Small group. This is similar to Grades 1-4, but uses different presentation techniques in the large Large group in all these settings refers more to the style of teaching rather than only the size of the group. Experiencing the love of Jesus. This underlies all our lessons and invites the children to respond! Touching the whole child. It aims at the heart, soul, mind and strength. It is experiential. 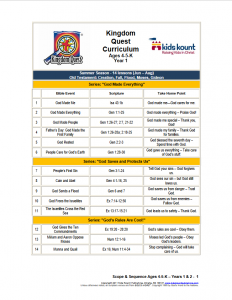 Kingdom Quest Early Childhood lessons for Ages 2 & 3 teach kids about Jesus in a language they can understand: participation! Young children begin with a puppet presentation and the Bible event. In their small groups, they reinforce the Bible truth through a snack, craft, game, songs, and even acting out the Bible event themselves. They take home their craft and their “God Talk at Home” page that helps the learning continue in the home! 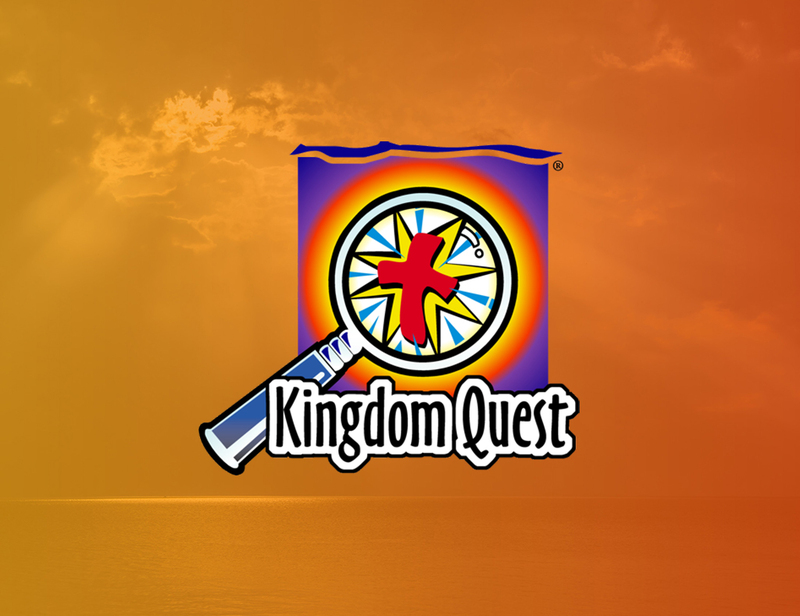 Notice: In the Kingdom Quest Lesson the seasons are NOT divided into four equal parts of 13 lessons. Instead Summer has 14 lessons, Fall has 13, Winter 21, and Spring 10. Total: 58. Why? Our seasons are marked between days in the calendar. Summer begins with Memorial Weekend and ends with Labor Day. Fall ends at Thanksgiving. Winter covers from Advent to Easter. Spring is from Easter to Memorial Weekend. You will always have more lessons than you need in a series. 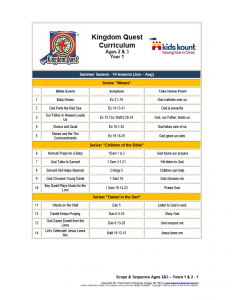 This Kingdom Quest age grouping includes 4-year-olds and 5-year-olds, but also might include 6-year-olds who are in kindergarten. 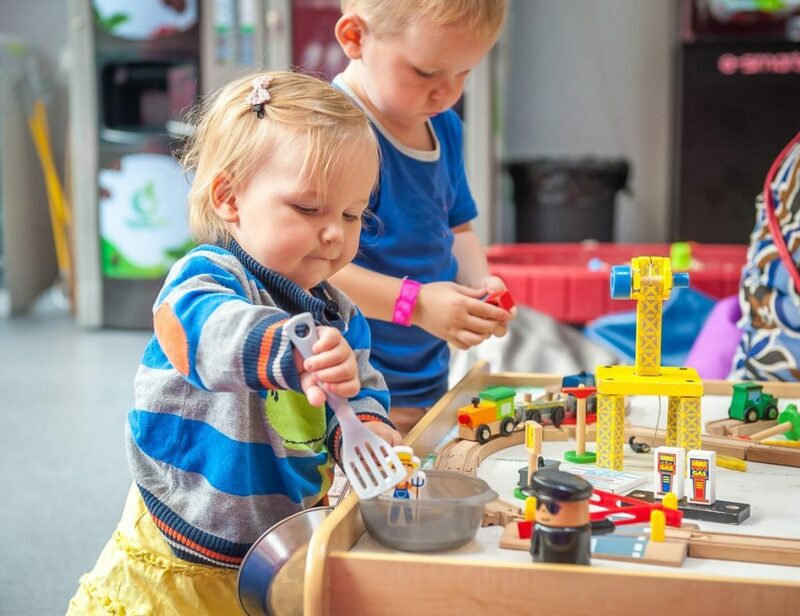 You can repeat our preschool lessons on a two-year cycle. Lessons are arranged in mini-series most often with a theme that is emphasized for 4 or 5 weeks. The kids gather together for singing about 10 minutes prior to the beginning of the hour. This tames anxious preschoolers and helps them ease into the group as they joing the singing when they arrive. Ages 4-5-K begins with the large group Bible event and teaching. Kids then move to their small groups where we reinforce the Bible truth through a snack, craft, and game. Lastly the kids gather one more time as a large group to review today’s lesson and teach Albie, the silly bird, the take home point of the day. “God Talk at Home” are the take home pages that encourage conversations about the lesson. Kids Church lessons are also available. This is a word and worship experience with small group breakouts. 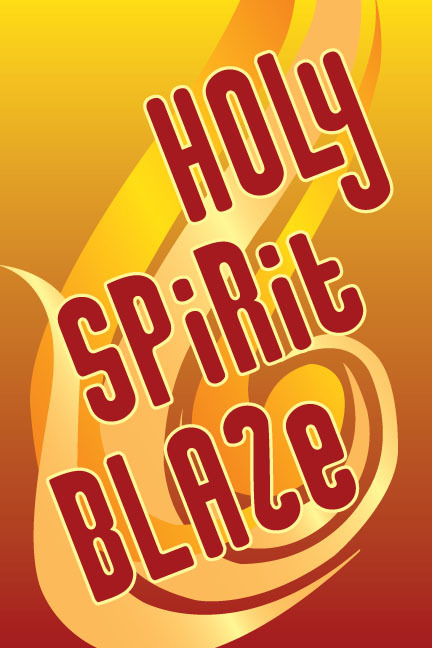 Worship comes alive with a variety of activities, prayer techniques, storytelling, Bible videos, learning games and more. 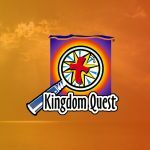 Lessons follow the same text and theme as Kingdom Quest. Together they are a great Sunday morning combination of two different children’s ministry experiences linked by a common theme. 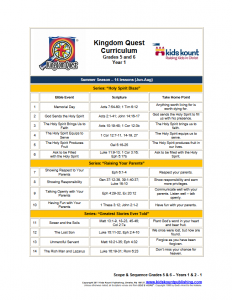 In Kingdom Quest elementary lessons for Grades 1-4, children begin in their small groups with a learning readiness activity. Then all groups come together for a creative presentation of the Bible event. A humorous puppet interacts with kids through a dilemma that is solved by the lesson that is taught. The large group presentation delivers solid Biblical content through interactive storytelling techniques, like a wacky professor, visitors from the Bible, and game shows to name a few. Download Backdrops to use with our large group presentation. Kids return to their small groups to investigate the Bible and discuss application. A learning craft, snack, or games helps the take home point stick! 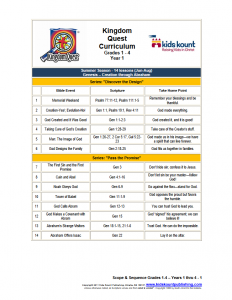 Kingdom Quest lessons for 5th and 6th graders are labeled as Quest 56 lessons. Instead of studying through books of the Bible, Quest 56 covers spiritual topics like prayer or life topics like friendship. Students begin with small group activities and discussion that help kids build friendships. Then groups gather together for a large group presentation using a dramatized character and audience participation. You can even download FREE SIGNS for each series. Kids return to their small groups to investigate the Bible and discuss application. This also involves some creative age-appropriate art project, snack, or learning activity. A sample series focusing on Ages 4-5-K, Grades 1-4 and Grades 5-6. Your selected downloads will normally go to you Download directory as a zip file. We suggest you create a Kids Kount Publishing directory on your computer and extract the files to that location. The extracted file will create a directory and your files will be in “word” format. This curriculum might be free but it still costs. It costs the expense and effort it takes to gather weekly supplies. So invest your curriculum budget in buying weekly supplies for hands-on learning. Also if you have someone gather these supplies for your shepherds and presenters, you will be amazed at how easy it will feel for them! Remember this isn’t an ordinary Sunday school experience. This is active learning! It’s worth the extra work of having a supply coordinator who does nothing but gather supplies! The Implementation Handbook is also recommended. It will help you implement and administer Kingdom Quest or Kids Church. Follow the 8-week countdown to Opening Sunday and you can count on a successful launch! Download Implementation Handbook now!